Someone around here likes to downvote every post of me, of course without giving any reason why he downvote my question/answer. All started one month ago, luckily an automatism reverted the downvotes. Just 5 days later, the next posts have been voted down, but not enough that the reversal automatism would be activated. After that, it take a bit longer but at the end of may there were again a lot of downvotes, and again some of them just in a couple of minutes. Peculiar: The downvotes are again created faster than anyone is able to read a question and the answer. Not to mention that you have to think about what you read and decide if it is good or not. Since that, in average every other day some of my posts get downvoted. Half of my posts already got exactly ONE downvote in the last month. That does not include the reverted downvotes, but some of them are downvoted again. I'm pretty sure, that (nearly) all the downvotes comes from one person. Ignoring my recent questions (which got some downvotes 2-3 hours after creation), there is no (active) post with two or more downvotes which were voted in the last month. 98% percent of these downvotes was the first downvote on the question/answer. Even posts which had a relative good voting (or even accepted by OP) got downvoted for the first time. And I don't think that it's done from someone else then the troll, I don't believe in such a coincidence. So, I don't care if someone downvote me for a given reason. Of course, some of my posts are not so good, that's OK. But in that case it is obvious that a downvote troll is active. So, what can I do? Maybe moderators are able to help me? Update: One hour ago, a serial downvote reversal raised. Thanks for looking into that issue. The user responsible has had his sockpuppet account deleted and his main account has been warned accordingly. As a result of the deletion, the serial downvotes have been cancelled and your reputation should have been adjusted as if they had never taken place. Just to follow up on this, since a lot of flags have come in regarding possible serial downvoting and I want to keep you guys updated—we've asked the SE team to look at this since there's not much that moderators can do, and see if possibly some/all of the offending votes can be revoked. We'll keep you updated with what we hear. 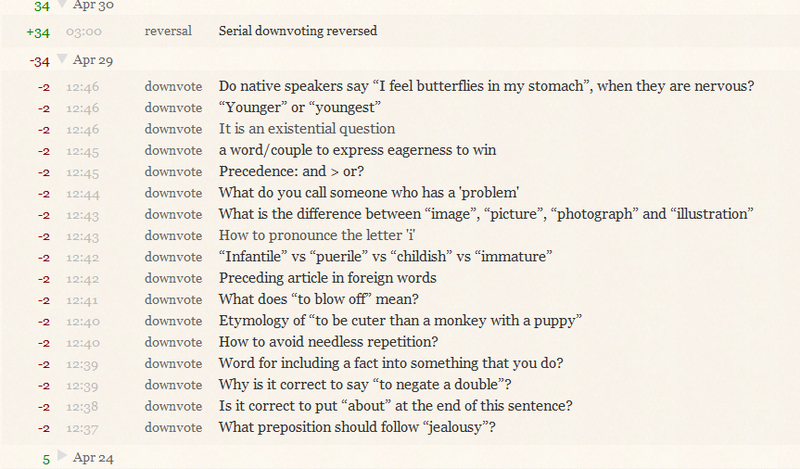 single downvotes on many of your questions/answers over a short period of time is most likely one person willfully choosing to downvote because it's you. There is an automatic process to detect such patterns and undo them (search the meta sites for 'revenge downvoting'). you can flag a moderator to inform them of the strange voting phenomenon and they can investigate and possibly undo the downvotes. I'm not in the position of giving a proper answer to your question, as I am relatively new to this site; however, a similar question was asked recently and one of the answers indicated discussing the matter here on meta, or else "flagging" the problem to the moderators' attention. As I'm experiencing something similar (although on a smaller scale, as for approximately one week I got one downvote per day, both on questions and answers of long standing and which often had not received any downvote before), yesterday I decided to flag one such post asking the moderators if they could look into the situation and let me know whether my guts feeling that it was always the same person who downvoted was correct. So far I haven't heard any comment, but today there was no downvote (or at least, not yet...) and I hope this means that the "leak" has been stopped. As you say, being downvoted is not relevant "per se" but I too resent having the feeling that it is done out of spite or for no real reason. Hopefully, someone will be able to solve the problem. I'm not sure what you're actually asking here. Is the vote-checking system good enough to catch all unjustified downvotes? - obviously not, it's only an automated system. Can a moderator look at the situation? is fair, and waiwai has done all that can reasonably be done. But your question reads as if you expect moderators to check every downvote, and decide whether each is reasonable. Even if that were possible, it would only be replacing the subjective views of the community as a whole with the subjective views of a few moderators. I am genuinely sorry that something like this happened, and hope you stay with the site. But if you do, I think you will find that 'community moderation' means you get some downvotes for reasons unconnected with the quality of answers, and some upvotes in the same way; it's happened to all of us. Democracy in action is not always attractive, but it's worth persevering with; the site won't improve if people go elsewhere because of its flaws. Unfortunately, the voting system here is flawed. First, let me say that ANYONE who looks at those screenshots and can't see the pattern of abuse is most likely guilty of doing that kind of thing themselves. It is not only clear as day to me that you were targeted for serial downvoting, but as you pointed out it was clear to the automated system that is in place to pick up on that kind of abuse. Anyone who wants to argue and call that "democracy in action" instead most definitely has a hidden agenda. Second, the voting system itself is unfortunately being run by a "good ole boy" network, and it is entrenched across the SE network. By that, I mean that a large majority of the votes being handed out to people, are being done by people who ALREADY have a large number of points. Those are people who spend a lot of time here on SE sites, and having spent that time they are quite sure of themselves in that they know what a good answer is, and what a bad answer is. On some of the SE sites, they even spend time together in the same chat rooms, every day. Now, by saying that it is "run by" I don't mean that they can alter the system at a coding level. But I do mean that if one votes up and comments on it, many more from the same clique will ALSO vote up on it. I've Personally seen this in reverse on a different SE site, where after alienating more than one of these "elite" users, the number of votes on my answers dropped significantly (and in most cases completely) where before I was regularly getting two or more votes. No, I'm not turning this into a gripe for my own benefit. I am simply pointing out that a majority of the voting going on is being done by a select few at each SE site, because they are the only ones who care to spend that much time voting and either encouraging or discouraging users. Third, aside from the "elite", the majority of other voters out there tend to vote with the crowd, IF they vote at all. A positive vote is more likely to attract another positive vote, just because it is there. People will see the positive vote, and look at the question in a positive light. This also works in reverse. A negative vote will attract another negative vote. People will see that a question or answer is being downvoted, and they will look at the material in a negative light (instead of trying to see something worth salvaging). Think about how many questions or answers you saw get multiple negative votes, when it could have simply been EDITED and improved... probably by YOU! I'm sorry you have been targeted by someone who has nothing better to do than try to make life miserable for you. It proves what I am saying, that votes are passed out for multiple reasons OTHER than merit though. Not the answer you're looking for? Browse other questions tagged support down-votes voting .